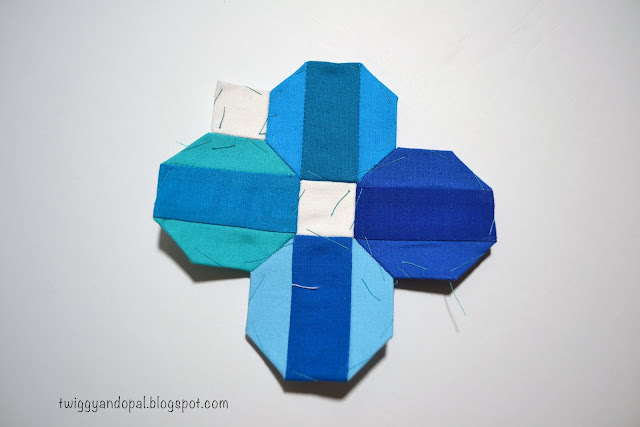 I've been calling this shape a hexagon...it is not! A hexagon has six sides, this is an octagon because it has eight sides. A stop sign...I know this! Math lesson over! I saw this design on Instagram, good old Instagram! At the time I was in need of a mindless project for my evenings and when I saw it, I knew it was the one for me. The reason I've called it a hexie is because that's the name of the pattern! I wonder if they know it's not?! Funny how one thing gets stuck in your mind and stays there regardless of right or wrong. You can get the free pattern here: 'Striped Hexie' from Tierney Barden. I knew I would be using solids just as Tierney had, after all I've plenty of scraps that would love to be used. I wasn't sure how big I would go with this, so I set about making color combinations that would give me a flowing rainbow of choices. Note: this batch of octagons ended up not being in the first picture piece. I made a terrible mistake...you'll see! 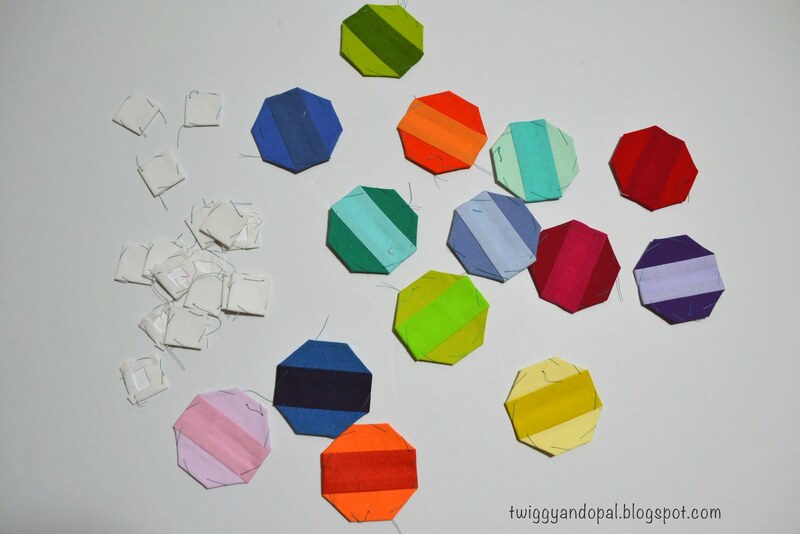 Once I got my colors together, I cut my strips and began piecing each grouping together. I used a glue stick to secure the fabric to the template and make sure my stripe was lined up correctly. I prefer thread basting as opposed to glue basting. It is most certainly a personal preference. With a lot of English Paper Piecing (EPP), you have to decide how you want to stitch the pieces together. I decided I'd start by making sets of four. 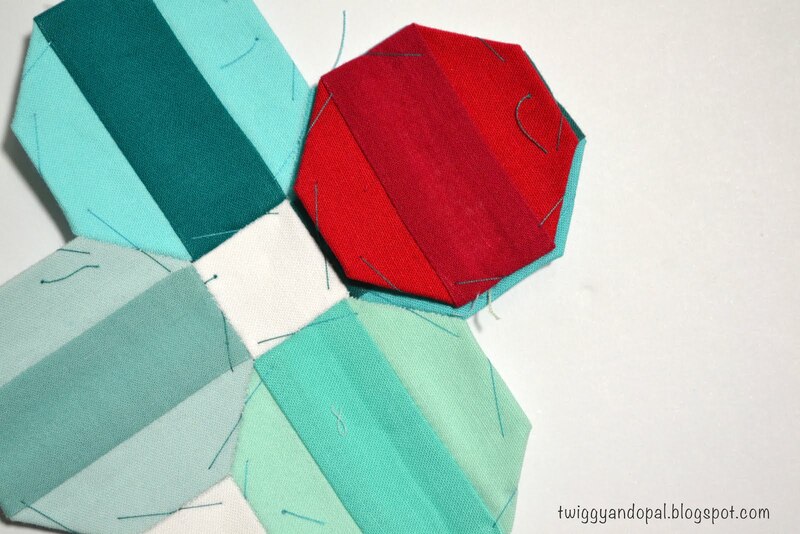 After laying out all my octagons and settling on a layout, I grouped and marked my sections and began stitching. Why didn't I use that batch of octagons? Let me tell you!! When printing templates of any kind, you are told over and over to print actual size and sometimes their is that little square that should measure 1" so you know you are printing correctly. This I know. This I have done time and time again! Except this time apparently. I didn't realize I had two different sizes until I had every single piece basted. It wasn't until I laid out all my beautiful pieces did I realize I totally mess up. You can see the difference here. I could have kicked myself and boy oh boy did I have a swearing tangent! After all the careful color pairings and not duplicating any color, I was left feeling defeated and so damn mad! Once I got over the self pity, I sorted the sizes and tried to reconfigure something with what I had. I ended up having to make a few more using the correct size, or the size I decided to go with. Luckily, it worked and I was able to breath again. I'm not sure what I did or how I did it. Probably printing on different days, using two different browsers or printing from iBooks is a good place to start. Yet one more lesson learned...again! I'm adding white squares to the sides and think I'll end up adding a border or negative space around it. I did have to cut extra squares in order to do this. Thinking back, I remember measuring a square, printing a template from Incompetech that was that exact size, cutting the squares, holding them up to the original square (which wasn't the original square at all), trimming them again ... at that point I should have known something was fishy! I couldn’t resist when I saw this design and had to jump right in! It’s a fun pattern to use everything including the kitchen sink as far as color! Almost every time I have to print a template I forget about printing actual size. I get the block made and find myself scratching my head (and cursing) wondering why it's not the correct size. If you hadn't pointed out that those have 8 sides, I would have happily believed they were hexies...at a glance the shape seemed correct :) This is turning out beautifully. The look a bit like macaroons to me! I do love the color combinations. Bummer about having different templates, and I'm glad you were able to "make it work". 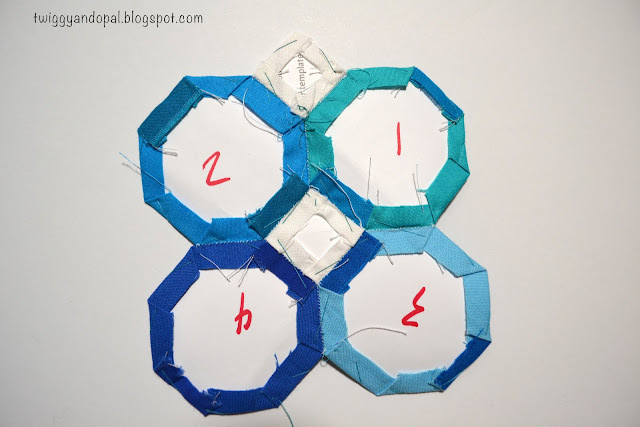 I started this project thinking they were hexies and would have continued thinking so if someone hadn’t pointed out they were octagons! 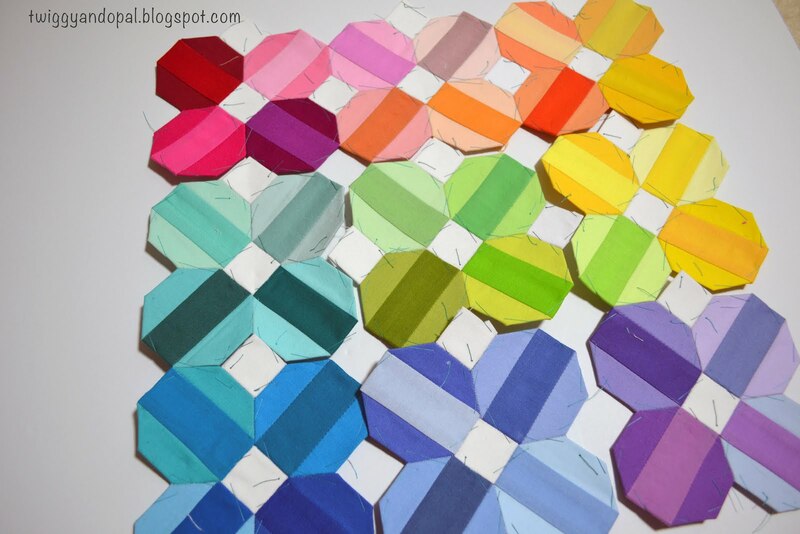 I can’t imagine not using templates for EPP! You have some mad skills! I love this project Jayne ! I'm looking forward to seeing how you will finish it. Ugh. I feel your pain. Having to do something twice really hacks me off, for a few minutes anyway. Then I do what I gotta do just like you did. Deep breaths, deep breaths. :D Love the results. I'm going to start calling you Rainbow Jayne. I keep thinking I have gone too far with all my rainbows! 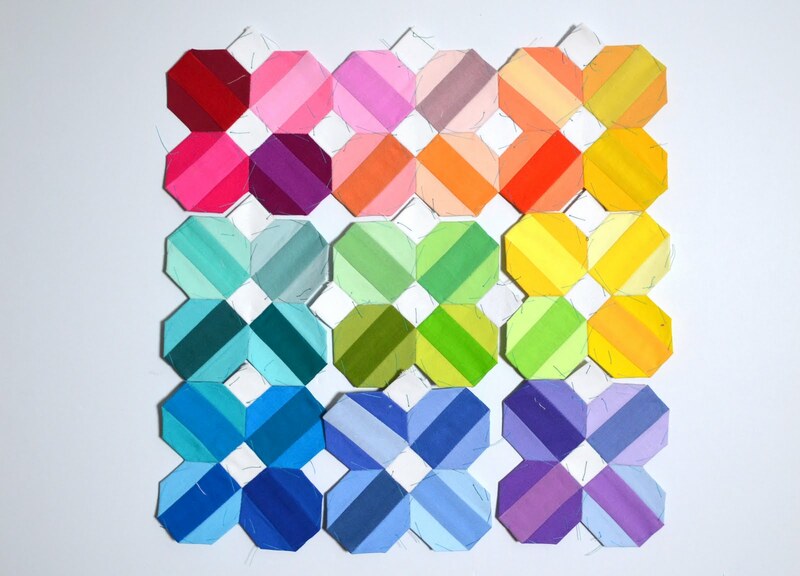 Then again…gotta love color! We can always make our mistakes work! 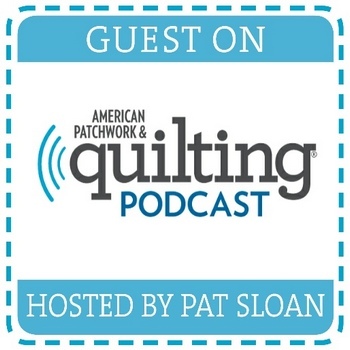 I think that is part of what makes quilting so much fun! These look like little jewels. Why can't all printers work the same - would make life so much easier. Oh to have your solid stash or scrap stash!! I love EPp , I find it's very relaxing , but I could never get all those stripes to match up ! It really was pretty easy to line up the stripes. They line up perfectly with one side of the octagon, plus there were lines to guide you! If it wasn’t easy like it was, I probably would have given up!! I really like this pattern. Too bad about the printing error. I bet you were steaming mad. That kind of error just makes me nuts. I do stuff like that all.the.time! Seems like you were able to find a good solution. The project is very cool. As always, your sense of color rocks the project.